Patriotism is in the air these days. The time of the year when all of us like to flaunt our love for our country, by changing our profile pictures, by dressing up in the tricolor, or by decorating our office / home in the tricolor theme. Really? Is that patriotism? In the world of flaunting our ‘status’, the real meaning of the Independence, and the significance of the freedom struggle seems to have been lost. How are we going to make the next generation the understand the pain and hardships that our forefathers endured to make sure we could be a free land? 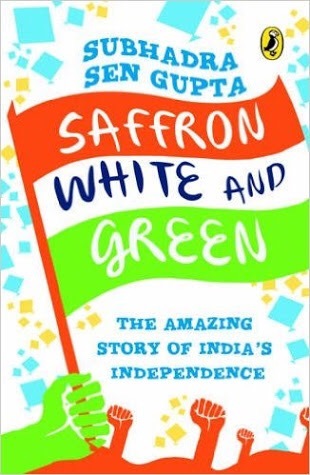 Thankfully, there are some really nice books to the rescue – the top among them being “Saffron, White & Green” by Subhadra Sen Gupta. The books spans the story of India’s attempts for independence from 1857, until a little after 1947, until the Constitution was drafted. And it’s nowhere the boring ‘Dates and Events’ narrative that seem to be the mainstay of most of our history textbooks. The very first thing it does is to set the proper social context, telling us all about the society and its norms at the time – after all, the Independence struggle also got us freedom from a lot of social ills prevalent then. There are so many hidden gems in the book, neatly divided into sections, and focusing on a time period and the heroes of that era. Each section ends with a special narrative of things you don’t commonly see in the history book – details about the British gentlemen who loved India for the land it was, the women who helped shape the struggle in their own ways, and how the royals were lost in the two worlds, confused if they should be loyal to their country and mix with the commoners, or maintain their facade of glamorous life and play puppets in the hands of British. The book simply hooks you in, and you can’t let go of it until you’ve turned the last page. And it doesn’t even end there – it gives you references for further reading, because you would definitely want to do that. This is a book that you must read with your children, and make them feel the intensity, the passion with which the previous generations sought the freedom for all of us! Who’s your favorite freedom fighter? Do let us know in the comments.